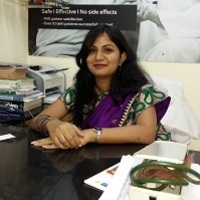 My specialities in Homoeopathy includes Hair and Scalp disorders,Skin diseases,Diabetes,Hypertension,Thyroid dysfunction,Female disorders,Obesity,Respiratory diseases, Piles ,Gastric disorders, Joint disorders. My specialities in Psychotherapy includes Parent-Child Counselling, Adolescent Counselling, Relationship Counselling ,Pre and Post marriage Counselling ,Stress, Depression, Anxiety disorders ,Obsessive Compulsive disorders and Phobias. I m Homeopathic Consultant with 5 yrs experience. I do practice as a Psychotherapist & Counsellor.